Carniny Youth under-17s, winners of the Rosebowl competition in their age group at the Hughes Insurance Foyle Cup. Carniny Youth teams enjoyed arguably their best week since the club began its involvement with the Hughes Insurance Foyle Cup. The club continued its long association with the tournament when four teams represented the club at the prestigious competition with over 250 teams participating. Carniny Youth U10s who finished 4th from 48 teams inthe 2015 Foyle Cup Tournament. The Under 10s (2005s) and 13s (2001s) led the way for the club with both teams topping their groups to make it into the main top tier Foyle Cup Competition. The Under 10s went unbeaten in their group and lost out at the semi final stage to eventual winners Bertie Peacock Youth. Niall Greer’s boys finished 4th best team from 48 teams. The Under 13s also topped their group to qualify for the Foyle Cup competition. They also lost out to the eventual winners in their semi final, a district team, Waterford Schoolboys. They also finished 4th best team in their age group. The Under 11s found themselves in a tough group, including a couple of favourites for the competition. Davy Hanna’s boys impressed going unbeaten in their group and qualified for the Foyle Rosebowl competition. The boys came up against some stiff opposition in the knockout stages winning their last match in an exciting penalty shoot out. The Under 17s found themselves in a tight group which went down to the last game to see who would qualify for Foyle Cup. The boys qualified for the Rosebowl in the end and played out an exciting match with Institute to win the Rosebowl final. The club would like to thank all the players, coaches and staff for their commitment to the club over the week and would like to thank all the parents and families who travelled to the North West to support the boys throughout the tournament. Results: Carniny 2 (Kennedy, McMullan), Cockhill Celtic 2; Carniny 10 (Graham 4, Kennedy 2, Moody 2, Greer, McMullan), Aileach Colts 2; Carniny 2 (Greer, Kennedy), Buncrana Hearts 1; Carniny 3 (Kennedy, Greer, og), Dergview 1; Carniny 0, Clooney Soccer Schools 0; Carniny 4 (Graham 3, Kennedy), Maiden City 4; Semi-final - Carniny 0, Bertie Peacocks 3; Third/fourth play-off - Carniny 1 (Graham), St Oliver Plunkett 2. The lads now go into 9-aside competitions knowing they can compete with the best. 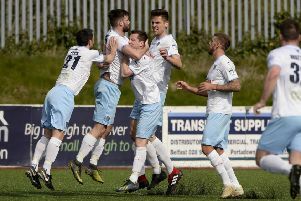 Results: Carniny 0, Ballymoney United YA 0; Carniny 0, Maiden City 0; Carniny 2 (Fletcher, Porter), Don Bosco 0; Carniny 2 (Fletcher, O’Boyle), Killea FC; Carniny 1 (Porter), Shankill Youth 1; Carniny 1 (Farenden), Tristar Boys 4; Carniny 1 (O’Boyle), Lagan Harps 2; Carniny i (O’Boyle), Strathroy Harps 2. Squad: McMullan, Clarke, McPeake, Devine, Farenden, Hanna, Patton, Larkin, Robinson, Porter, Murray, Fletcher, Ruddy, O’Boyle. Results: Carniny 4 (Holland, Hampshire and Graffin), Lifford Celtic 1; Carniny 11 (Graffin 3, Holland, Hunter, Hampshire, Lynn, Anderson), Killen Rangers 0; Carniny 1 (Holland), Mid Ulster Youth League 1; Carniny 0, Waterford Schoolboy Select 3; Third/fourth place play-off - Carniny 1 (Graffin), Derry City Colts 2. Carniny 1 (Price), Culmore 3; Carniny 3 (Agnew, Jaworski, Balmer), Kildrum 2; Carniny 0, Ramapo Valley 3; Rosebowl semi-final - Carniny 5 (Balmer 3, Hagan, Agnew), Hillsborough Boys 3; Rosebowl final - Carniny 4 (McCann, Balmer, Hagan, Armstrong), Institute 3. Carniny 17s wish to thank the staff of the Drummond Hotel in Ballykelly for being excellent hosts and all the sponsors such as The Country Garage, Ski & Sport and others who wish to remain nameless for making the experience possible. Player of match v Institute - Krystian Jaworski.